This is the second half of a list of main rail infrastructure corridors to/from northern Italy, including some that do not cross the main Alpine range. The present, planned, and possible rail infrastructure is indicated for each corridor, including new high-speed lines (HSL). Read the introduction first: Transalpine rail routes. Alpine relief by user jide under CC 3.0 licence. The first half ended with the proposed Splügen trans-Alpine high-speed route . The Splügen Pass is traditionally the boundary between the eastern and western Alps. The trans-alpine route of the metre-gauge Rhaetian Railway, from Chur to Tirano. Although there are two long tunnels (Albula and Vereina), neither crosses the Alpine watershed: it is crossed without a tunnel, through the Bernina Pass. The Rhaetian network is geographically centred on Chur, which would probably be served by any approach to a Splügen base tunnel. Rhaetian Railway network map by user Sansculotte under CC 3.0 licence. 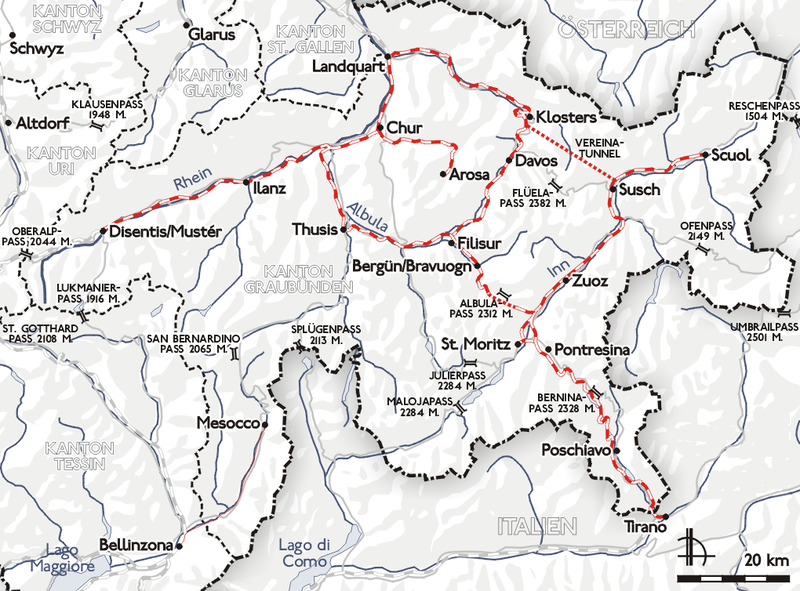 Extension of the Rhaetian Railway, south from St. Moritz to Chiavenna over the Majola Pass, creating a secondary trans-Alpine route from Chur. This line has been planned since 1885. It could be extended further via a new 15-km tunnel to the Misox valley / Val Mesolcina, and then via the partly closed Misox local line to Bellinzona, which is also metre-gauge. Planned but never completed extension of the Rhaetian Railway, north from Scuol to Landeck, in the Inn valley. Landeck is on the Austrian east-west line, Arlbergbahn. In combination with the Chiavenna extension, the Scuol – Landeck extension would create a secondary Milano – Innsbruck route, primarily for tourism and regional access. Regional line from Landeck to Bolzano/Bozen, via a new Reschen pass tunnel. The line would use the existing Vinschgerbahn / Val Venosta line from Mals/Malles. The tunnel was planned with this line, but never built. Extension of the Rhaetian Railway east in tunnel from Scuol to Mals/Malles, creating a Chur – Bolzano regional route. The Landeck to Mals/Malles line would be standard gauge, and if it was built, this is an alternative extension of the metre-gauge Rhaetian network. (A parallel alignment over the Ofenpass was once planned). A metre-gauge line Chur – Bellinzona, via Thusis and the San Bernardino Pass was already planned after the First World War. This line would, in effect, parallel the Splügen base tunnel. In the absence of a base tunnel, it would offer a relatively direct route from eastern Switzerland to Milano, but a metre-gauge mountain railway is not a high-speed line. 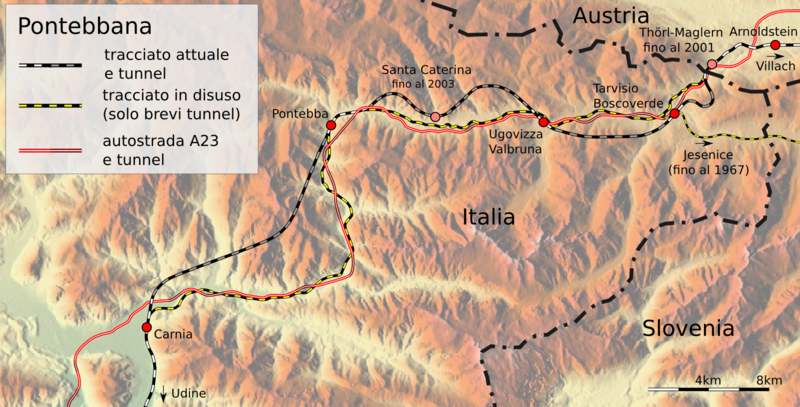 Tirano – Edolo tunnel. This is not a transalpine line in itself, since it is entirely south of the watershed, but it would connect the Bernina line terminus at Tirano, with the Edolo – Brescia line, and so create a Chur -Brescia route. The Bernina line, St. Moritz – Tirano, near the Bernina Pass: public domain image by David Gubler. Reschen base tunnel: there are no existing north-south approaches, so this only makes sense as part of tunnel chain, such as this tunnel chain to Bergamo. New direct line München – Innsbruck, with a Karwendel base tunnel between the Isar and Inn valleys. This is essentially a cut-off line toward the Brenner base tunnel, avoiding the existing C-shaped line through Rosenheim. 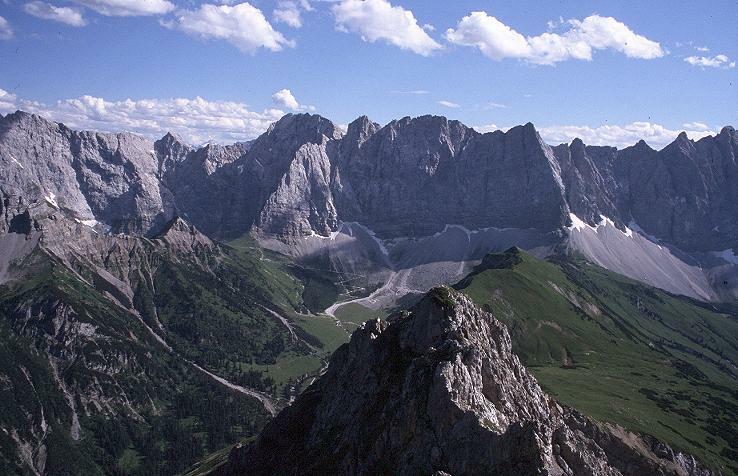 The Alps as barrier: Karwendel. Image by user Luidger under CC 3.0 licence. New Fernpass base tunnel from Lech valley near Reutte, to Inn valley near Imst. This alternative for a Karwendel base tunnel does not shorten the route from München to Innsbruck. 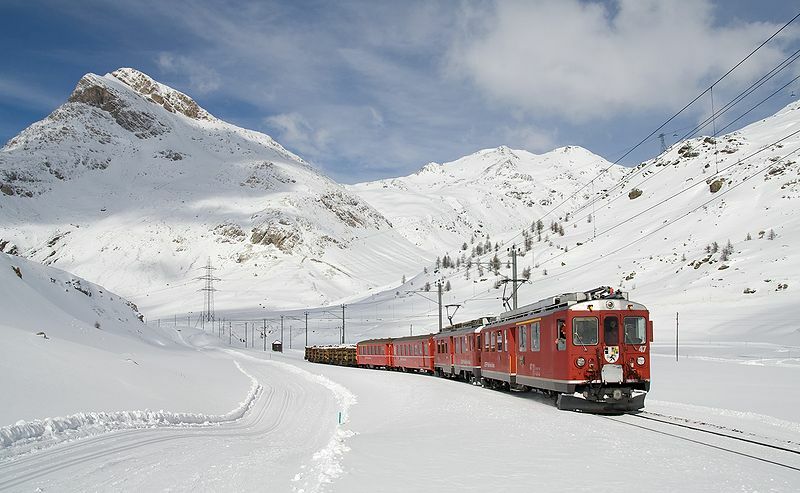 It is primarily intended for transit freight, in combination with a base tunnel to Meran/Merano or Bolzano/Bozen. New Felbertauern base tunnel, as part of a tunnel chain. First a cut-off tunnel would connect Kufstein (on the München – Innsbruck line) to Kitzbühel. A second tunnel would run 16-18 km to near Mittersill in the Salzach valley, and the 40-km base tunnel from there to the Isel valley, which joins the Drau valley at Lienz. Although Lienz is a small town, its location among major valleys makes it a potential rail junction, see below. The existing Bolzano – Villach – Maribor route (Ferrovia della Val Pusteria in Italy, and Drautalbahn in Austria), passes through Lienz. Lienz to Friuli via Plöcken Pass tunnel chain. The new route would follow the Drau valley line from Lienz, and then turn into a new Gailbergsattel tunnel. It would cross the Gail valley, into a new 15-km Plöcken Pass base tunnel. On the side, a new line would run through Tolmezzo, to join the existing Udine – Villach line. In combination with the Felbertauern base tunnel, the line would create a new strategic München – Trieste route. Lienz to Padova regional route. This requires a new tunnel between the Drau and Piave valleys, connecting to the existing line to Padova via Belluno. A direct tunnel would be disproportionately long, for this regional corridor. A longer alternative, over the Drau valley line to Dobbiaco/Toblach, and then a new line via Cortina D’Ampezzo, would probably require less tunnelling. Tauern corridor München – Salzburg – Villach – Ljubljana. From Salzburg, the route consists of the Salzburg-Tirol line and the 81-km Tauernbahn itself, to Spittal. Although this is Pan-European Corridor X, the line still has single-track sections: upgrading is in progress, but slowly. There are no plans for a new Tauern base tunnel: with portals south of Bischofshofen and north of Spittal, it would be about 45-50 km long. South of Villach, the corridor continues through the Karawanken Tunnel to Jesenice and Ljubljana. Video: over the Tauern line. Spittal – Pontebba cut-off line, from the Tauern line to the Villach – Venezia line, avoiding Villach itself. Most of the line would be in two tunnels. A 20-km tunnel from Spittal on the Tauern line would run to the Gail valley near Hermangor. From there, a 12-km tunnel to the existing Pontebba line to Udine, at Pontebba itself. This line continues to Udine and from there to Trieste and Venezia. Venice – Vienna corridor: a strategic route from northern Italy to central Europe. This consists of the lines from Venezia (Venice) and Trieste to Udine, and the Pontebba line to Tarvisio, which has been completely reconstructed north of Carnia. Old and new Pontebbana rail lines: map by Vuxi under CC 3.0 licence. The corridor continues from Tarvisio through Villach, on the historical Rudolfsbahn to Leoben, and then over the Semmering Pass line (Südbahn) to Vienna. The 125-km Koralmbahn with a new 33-km Koralm tunnel, is a new line from Graz to Klagenfurt (and Villach). This in effect creates an alternative Venice – Vienna route, through Graz. The new Semmering base tunnel will also shorten this route. The Linz – Graz corridor, the route of Austrian Pyhrn Autobahn A9. Unlike the Autobahn, the railway was not built as a through route. It consists of the existing Pyhrn Pass line Linz – Selzthal and part of the Rudolfsbahn to St. Michael and Bruck an der Mur, where it links to the main line to Graz (Südbahn). An effective rail route requires a new Gleimalm base tunnel, about 18-20 km long, and parallel to the Autobahn tunnel. It would connect the rail junction at St. Michael, to the Mur valley north of Graz. Linz – Klagenfurt corridor: the existing lines form a zig-zag route. A new Niederere Tauern base tunnel, from Selzthal to Niederwölz for instance, would connect to the existing Rudolfsbahn. It would create a more direct Linz – Klagenfurt route, but the tunnel would be about 40 km long. New Karawanken base tunnel, from the Klagenfurt basin into the Ljubljana basin. A tunnel from Feistritz to Žirovnica would be about 15 km long, a more direct tunnel under the Loibl Pass to Tržič about 20 km. In combination with a Niederere Tauern base tunnel, this would create a new Linz -Ljubljana route. The line from Jesenice to Gorizia / Nova Gorica along the Soča / Isonzo valle, Wocheinerbahn in German. The line was built to the Austrian imperial port of Trieste, and connects to both Villach and Klagenfurt via the Karawanken tunnel. It lost its strategic significance with new borders, and is now a regional line. See the proposal to reroute the line in Gorizia / Nova Gorica itself. Venezia – Trieste – Ljubljana corridor. The existing Venezia – Trieste main line terminates at Trieste Central station. Trains to Ljubljana do not pass through this station: they leave the line on the outskirts of Trieste, and climb to Villa Opicina, a junction station on the Karst Plateau above the city. A new HSL Venezia – Trieste – Ljubljana is planned. The official route has not been fixed, but almost certainly it will also serve a station on the plateau. Beyond Villa Opicina, the main line is the old Austrian imperial main line, the former Südbahn. This is the original Venice – Vienna corridor: via Ljubljana, Maribor, Graz, and the Semmering Pass. A Slovenian HSL is planned between Ljubljana and Maribor, but no date has been set for construction. The proposed HSL Maribor – Wien is a variant of the ‘Ungarische Flachbahn’ or Hungarian plain route, avoiding the Alps entirely. The Aspang route is a minor transalpine route south from Vienna, consisting of the Aspangbahn, the Wechselbahn, and the Thermenbahn. The route to Graz is indirect, but it could be linked to the proposed Maribor – Wien HSL at Szentgotthárd, by new link line from Fürstenfeld. A new HSL to Rijeka, diverging from the Venice – Ljubljana HSL at Villa Opicina (or another plateau station above Trieste). There is no direct Trieste – Rijeka line at present. The existing coastal rail line into Trieste Central station would connect to proposed new Istrian coastal line, via a tunnel under the city centre. 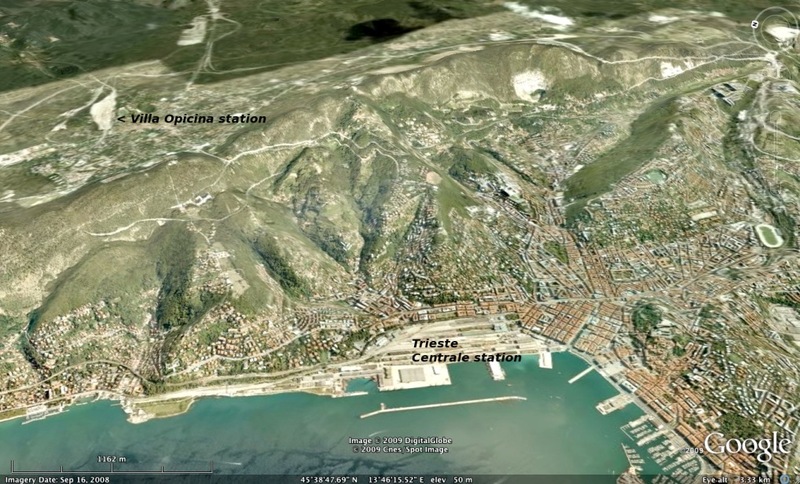 The coastal railway to Trieste is the eastern equivalent of the line Nice – Ventimiglia – Genova. It is the only other coastal route out of northern Italy, and it closes this list of ‘transalpine’ routes, in a broad sense.